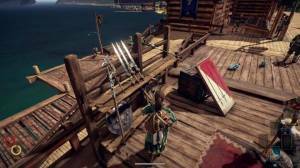 Knowing how to craft weapons and armour in Outward is a must as it will help you during your adventure as you will inevitably be facing all manner of wild beasts and human foes. Below is a list of what you can craft in Outward along with the ingredients you will need to collect to make the corresponding weapon or armour. You don't need in-game recipes to craft anything, just the ingredients. Crafting is done using the manual recipe function and doing so will save you money and time as you will not have to purchase or find recipes. 1x Flintlock Pistol, 2x Occult Remains, 1x Crystal Powder. 2x Coralhorn Antler, 1x Recurve Bow, 1x Crystal Powder. 2x Horror Chitin, 1x War Bow, 1x Occult Remains. 1x Claymore, 2x Predator Bones, 1x Linen Cloth. 1x Steel Saber, 1x Assassin Tongue, 1x Palladium Scrap. 1x Gold-Lich Mechanism, 1x Iron Sword, 1x Firefly Powder. 1x Iron Mace, 1x Predator Bones, 1x Linen Cloth. 1x Gold-Lich Mechanism, 1x Iron Mace, 1x Firefly Powder. 2x Obsidian Shards, 1x Palladium Scraps. 1x Iron Scrap, 2x Linen Cloth. 1x Manticore Tail, 1x Palladium Scrap. 2x Broken Goldem Rapiers, 1x Palladium Scrap, 1x Crystal Powder. 1x Iron Axe, 1x Predator Bones, 1x Linen Scrap. 1x Beast Golem Scraps, 1x Iron Axe, 1x Palladium Spikes. 1x Horror Chitan, 1x Fang Axe, 1x Palladium Scrap 1x Occult Remains. 1x Alpha Tuanosaur Tail, 1x Brutal Axe, 1x Palladium Scrap. 2x Wood, 1x Linen Cloth. 1x Phytosaur Horn, 1x Fishing Harpoon, 1x Miasmapod. 2x Gold-Lich Mechanism, 1x Iron Claymore, 1x Firefly Powder. 2x Thorny Cartilage, 1x Iron Spear, 1x Palladium Scrap. 1x Spear, 2x Predator Bones, 1x Linen Cloth. 2x Shark Cartilage, 1x Palladium Scrap, 1x Felling Axe. 1x Iron Greataxe, 2x Predator Bones, 1x Linen Scrap. 2x Alpha Tuanosaur Tail, 1x Brutal Greataxe, 1x Palladium Scrap. 2x Obsidian Shard, 2x Palladium Scrap. 2x Manticore Tail, 1x Mantis Greatpick, 1x Palladium. 1x Greathammer, 2x Predator Bones, 1x Linen Scrap. 2x Assassin Tongue, 1x Fang Greatsword, 1x Palladium Scrap. 2x Thorny Cartilage, 1x Iron Claymore, 1x Palladium Scrap. 2x Beast Golem Scraps, 1x Iron Halberd, 1x Spikes-Palladium. 1x Iron Halberd, 2x Predator Bones, 1x Linen Scrap. 1x Iron Claymore, 2x Predator Bones, 1x Linen Scrap. 1x Wood, 2x Linen Cloth. 1x Ammonite, 1x Padded Armour, 1x Palladium Ore.
1x Ammonite, 1x Padded Helm, 1x Palladium Scrap. 1x Ammonite, 1x Padded Boots, 1x Palladium Scrap. 1x Helmet (any) 1x Hide. 1x Armor (any) 2x Hide. 1x Boots (any) 1x Hide. 1x Makeshift Leather Hat, 2x Scaled Leather, 1x Predator Bones. 1x Makeshift Leather Attire, 2x Scaled Leather, 1x Predator Bones. 1x Makeshift Leather Boots (or 1x Sandals? ), 2x Scaled Leather, 1x Predator Bones. 1x Horror Chitin, 1x Fang Shield, 1x Palladium Scrap, 1x Occult Remains (18 Impact Resistance). 1x Round Shield, 1x Predator Bones, 1x Linen Cloth (12 Impact Resistance). 1x Desert Tunic, 1x Insect Husk. 1x Gold-Lich Mechanism, 1x Round Shield, 1x Firefly Powder. Check out our Best Weapons page to find out which are the best ones to have in Outward.